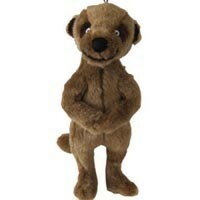 Super Squeaky Meerkat Cuddly Dog Toy. The Good Boy Super Squeaky Meerkat Cuddly Dog Toy has a great design made in soft plush material. It's not only humans who have gone Meerkat crazy, your dog's will go crazy too! This cuddly Meerkat is super squeaky fun for your dog. Please note this toy is not indestructible. All dogs should be supervised whilst playing. It looks nothing like the picture ( mine has a white face) but puppy is having great fun with it.